My primary goal for this website is to dispel a notion - specifically, the notion that God will torment some people for all of eternity. That notion is false, with almost no support in Scripture, and has caused much damage for both Christians and non-Christians alike. I want to emphasize the point that I am dispelling a notion, rather than asserting a certain truth. That is, when I assert that "God will not torment unbelievers for eternity", the natural question to ask is, "What, then, will happen to unbelievers?" The answer I give is that I'm not sure. Among those who take the Bible as their authority, two alternatives are proposed. One alternative is that God will annihilate unbelievers at the judgment day, ending their existence. The second alternative is that all men will eventually repent and thereby receive that salvation that was earned by Christ when he died on the cross. In my mind, the majority of scriptural passages indicate that unbelievers will be destroyed and cease to exist, but there are some passages seem to indicate, and some compelling arguments can be to be made, that all men will eventually repent. While I remain undecided on that issue, what is very clear to me is that almost zero evidence exists in scripture to support the notion of eternal torment. I know that is probably a surprising statement for many of you to read, but the evidence is difficult to deny. Dispelling the notion of eternal torment is important because that notion impacts our understanding of the God's character, and our understanding of God's character impacts the way we live in multiple important ways. I grew up believing this. This idea of eternal torment kept me awake many nights and persisted as a shadow deep in my heart whenever I thought about God and his character. I was not alone in that belief. Many people still believe this today. After a great deal of research and prayer, I now believe something different. I have discovered that the Bible contains almost no evidence to support the notion that God intends to torment some people for eternity. I know that may sound strange to many of you, but it is true. I will deal in detail with the Scripture in this essay, but for now, my goal to discuss why this issue matters. To fully convey the importance of this issue, I will first address the attempt by some teachers to separate the character of God from the way he decides to treat unbelievers. Let me explain further. The assertion that God will torment some people eternally seems to contradict the assertion that He is purely and infinitely loving. Many people join me in that belief, intuitively feeling that those two notions are contradictory. Some of those who believe in eternal torment try to soften this apparent contradiction by claiming that it is people who choose hell, and not God who sends them there. Some of these teachers have even asserted that unbelievers will voluntarily choose eternal torment because they don’t want to be with God. I think this notion is misguided. This torment will take place in the presence of the angels and the presence of the Lamb, who is Jesus. (Yes, there will be torment, but this torment will not last forever. I will deal with that in more detail in other parts of this website) This torment does not occur separated from Christ, but it takes place in the presence of Christ. To assert otherwise is to contradict this passage. God chose to put into the Garden of Eden the Tree of the Knowledge of Good and Evil. In doing so, he knew that man would choose to sin. This is confirmed by Peter, when he tells us that we were redeemed “with precious blood, as of a lamb unblemished and spotless, the blood of Christ. For He was foreknown before the foundation of the world”. References to Christ as a lamb are direct allusions to the sacrificial lamb in the Old Testament, so when Peter says that the lamb was foreknown from the foundation of the world, he clearly implies that God knew from the foundation of the world that a sacrifice for sin would be needed. Other passages also assert that God knows the future – he declares the end from the beginning. Included in that knowledge must be the form of punishment that he planned for those that reject his salvation. It was God’s idea to create this world and to create each one of us. Before he moved forward with his plan, God saw it laid out before him. He chose to move forward with this plan that we is now being revealed. Scripture does not allow us to make the claim that the final punishment is somehow out of God’s control. God's character is revealed by his work, and I reject any attempts to claim that the final punishment chosen by God does not reflect his character. We must do our best to gain a proper understanding of hell so that we gain a proper understanding of God's character. We Christians are taught that we must love God. In fact, the greatest of all commandments is to love God with all of your heart, soul, mind and strength. Fortunately, the Bible contains much evidence to demonstrate that God is lovable and gives many examples of His loving actions. These actions give us powerful motivation for obeying the greatest commandment and loving Him in return. However, along with this teaching about the loving nature of God, many of us have been taught that God will torment some people for eternity. The willingness to torment another person is not generally an endearing quality. Most of us would find it repulsive. How do we love a God that acts in a way we find repulsive? Imagine that you and I are close friends and I invite you to dinner. Midway through the dinner, you hear what sounds like groaning noises coming from the basement. I excuse myself and go downstairs, after which you hear the sound of a whip lashing and chains thrashing about. Someone screams and is clearly in agony. I then come back upstairs and proceed with dinner. You realize that I am keeping somebody in my basement and am periodically torturing them. How would that impact our relationship? Would this truth endear you to me? Would you be eager to come visit my house? I don’t think so. I suspect you grow uncomfortable with me and seek to avoid my presence. Even if all my dealings with you were fair and generous, wouldn’t you be impacted by the fact that I was willing to torture somebody else? If you believe that God will inflict eternal torment, then you are in a similar situation. Sure, God sent his son and has given much evidence of his love for you, but can you claim that his capacity for inflicting infinite pain on others has no impact upon you? The single greatest commandment is to love God. If God truly does have the capacity to inflict infinite torment upon a person, would that impact your ability to love him? If so, then it is of utmost importance that your understanding of this issue be aligned with Scripture and be based upon the truth. We all have a deep instinct for self-preservation. In dangerous situations, we grow alert and tense, prepared for action. Dangerous situations are not peaceful. Is God dangerous? May we rest in his presence? For Christians, our internal peace rests upon our belief in God’s love. If we doubt the truth of God’s love, our peace will suffer. I suspect all of us experience times in life where we doubt our own acceptance by God. If you believe in eternal torment, then you might wonder during your darkest times if God might someday direct that wrath toward you. God's willingness to inflict infinite retribution could leave us all wondering exactly what his character is, and leave us unsure in the deepest part of ourselves whether our relationship with God was indeed secure. Our internal peace would be less stable if we cling to a belief in eternal torment. In addition to being concerned about our own well-being, we also are concerned about the well-being of others. Most significantly, our peace can be seriously undermined when tragedy happens to our family and closest friends. We have all read in the news about abductions and unimaginably wicked treatment of children by ruthless criminals. As a parent, I can’t imagine an agony more terrible than to have my child abducted and subject to the whims of some vile predator. That agony would consume me and make life unbearable, but no matter how much pain might be inflicted on our loved ones by wicked men, that pain would be insignificant compared to the pain of eternal torment. The pain of eternal torment would be infinitely greater than the worst pain ever inflicted upon one human by another. How can we even begin to deal with the possibility that our loved ones might someday suffer the torment described by Jonathan Edwards in the passage above? For my part, I can think of no way to find peace with that thought. The only way to deal with it would be to put it out of my mind. Is that the character of the God you try to love? Would the God of pure and infinite love do something to your loved ones that is so unimaginable that you can’t even bear to think about it? We human beings have a great capacity for rationalization. We can deny and suppress feelings and thoughts that cause us discomfort. Those denials and suppressions give a measure of comfort at the surface, but can leave deep internal conflicts. I realize that I am raising uncomfortable issues, but I truly want to delve the bottom of this issue and bring it to light, so I am going to press on with one more question. Imagine the one person in life who means the most to you. Now, consider that this person is an unbeliever. (For some of you, the most important person in your life actually is an unbeliever, so this is not a hypothetical question.) Now, if this person remained unrepentant and refused to accept the salvation of God, would you then decide that they must suffer the eternal torment described by Jonathan Edwards? If God delegated the choice of punishment to you and allowed you to choose, would you choose to subject them to eternal torment? Would you sentence your most beloved family member or friend to unimaginable eternal torment? I can’t imagine anybody would say yes – I certainly wouldn’t. I have yet to find a person, even among those who believe in eternal torment, that would choose eternal torment in this situation. Does that seem strange to you? Why does this idea of eternal torment so deeply contradict our own sense of appropriate justice? To answer that question, most of those who believe in eternal torment would say that God is absolutely holy, and the fact that we would choose something different than us just shows the degree to which we fall short of his holiness. Let’s consider that thought for a moment. Scripture teaches that as we grow in our faith, we grow more and more like Christ. If that is true, and if Christ fully supports the notion of eternal torment, then those believers among us that are most holy and most loving would most strongly affirm the notion that their closest companions should be eternally tormented if they refuse to repent. And as each of us mature in our faith, we show grow increasingly more comfortable with the idea that our beloved family and friends should suffer eternal torment if they refuse to repent. Is that what is happening in your life? Have you grown more comfortable with the thought of your beloved family members and friend suffering the torment described by Jonathan Edwards? If not, then maybe that should cause you to reconsider your belief. Maybe you truly are growing more like Christ, but Christ will not make this decision that seems so unbearable to you. If you are like me and would never choose eternal torment for your loved ones, and yet you continue to believe in eternal torment, then you have a deep internal conflict to deal with. You are worshiping and attempting to serve a God that is willing to do that which you never would do – that which we can’t even bear to think about. If these thoughts leave you unsettled in the deepest part of your spirit, then this website may show you a way out. This website will provide you with a deep and thorough examination of Scripture, pursuing the goal of determining exactly what is taught on this subject. I believe that you need not continue to fend off those unbearable thoughts that lurk at the edge of your consciousness, and you need not continue to try to reconcile ideas that are irreconcilable. The God who has loved you in your most intimate times of prayer and worship would not subject your loved ones to the agony described by Jonathan Edwards. Our understanding of how God treats people will have a significant impact on how we treat people. I want to investigate those situations where we treat each other poorly. By ‘poorly’ I mean those times when we cause pain to another person in a situation that does not involve Justice. All of the situations in life where we cause pain to another person can be grouped into just two categories: Selfishness & Justice. Selfishness refers to those instances where we are willing to cause pain, or allow pain, in order to get what we want. Justice refers to situations where we cause pain for some unselfish purpose. Justice can be subdivided into four categories: Discipline, Deterrence, Retribution & the Greater Good. Discipline is an attempt to produce growth or wisdom in another person. A parent might Discipline a child from a sincere desire to leave him better off. Many times Discipline is painful, but this pain is deemed necessary to achieve the desired outcome. Deterrence refers to situations where we create painful punishments for crimes as a means to prevent people from acting Selfishly in a way that harms others. The goal of Deterrence is to create a better society. Third is the idea of Retribution, which is intuitively obvious to each one of us, but somewhat difficult to put into words. The best way I know how to explain Retribution is say it is this: If one person harms a second person out of selfish motives, something in the universe dictates that the first person should suffer for that action. It just seems right that there be some form of Retribution towards those who have harmed others. Finally, we have this idea of the Greater Good. Sometimes we cause pain to one person because we believe causing that pain is the only way to achieve an even greater amount of good for someone else, or for some other group of people. Now, to state the obvious, Selfishness is bad, but Justice is good. For the most part, we want to be good, and we want others to believe we are good. In both the lives of individuals and also in the greater story of institutions and nations, we see a very common behavior. In almost every situation where we humans decide to cause pain to another person, those who cause the pain make the argument that they are doing it for the sake of Justice and not due to Selfishness. For each of these phrases, you can imagine a person acting out of Selfishness, but trying to make the argument that his action was motivated by Justice rather than by Selfishness. The word we use to describe this behavior is Justification – we are attributing our actions to Justice. A few days ago, some friends were scheduled to arrive at our house within 30 minutes or so. Earlier in the day, my wife had asked me to help with some chores before they arrived. As I was vacuuming the floor, I began to fear that I might run out of time to complete the rest of the chores. When I was growing up, the vacuum cleaners had big bags attached for collecting the dirt. You could vacuum many times without needing to change the bag. Our current vacuum cleaner does not have a bag, but just a chamber that collects the dirt. My wife has made it clear that the container should be emptied after each vacuuming. I don’t like that task. It's tedious, and the emptying process often generates a cloud of dust over the trash. Sure, it only takes one or two minutes, but I just don’t like to do it. So as I was finishing up the job, it occurred to me that maybe I didn’t need to empty the container in this instance, given the fact that I was running low on time. In considering that possibility, I imagined that my wife would discover in a few days that I didn’t empty the container. In my mind, I prepared my reply: “I didn’t have time because Will & Susan were about to show up.” Certainly she would see the wisdom in my actions. In this example, her emptying of the container at some point in the future is the pain that I am allowing. I was seriously considering the option of leaving that pain to her and avoiding it myself. In debating whether to empty the container or not, it was not sufficient for me to say, "I didn't empty the container because I didn't want to." It was important to me to have some reason, some Justification, for why I didn't empty the container. In this case, I was tempted to appeal to the Greater Good of getting the chores done before our friends arrived. It didn’t really matter whether the argument was truly sound – what mattered was whether I had an argument to give. In this case, the extra two minutes that it would take to empty the container would make no significant difference in what I was able to accomplish prior to the arrival of our guests. These arguments we make to justify our actions take place deep in the murky parts of ourselves, somewhere near the border of our conscious and unconscious mind. In this instance, I happened to observe this argument inside myself, but I often accomplish similar feats of justification without being fully aware of it. I resist having these arguments come into the full light of the truth, because they are often unsound and manipulative. If I looked at them too closely, I might be forced to relinquish what I want. How is this impacted by the character of God? As Christians, the success of our Justification relies upon whether God will agree with our rationale for causing pain. God is the source of Justice and it is his character that determines what is just. If a rationalization is valid, then we should be able to find a similar action of God. Do you suppose we might use God’s willingness to inflict eternal torment as a means of justifying our own selfish actions? It seems possible to me, and maybe even likely. We would need some way to connect God’s action to our own. How might we categorize the action of God tormenting people for all of eternity? Consider the four subcategories of Justice: Discipline, Deterrence, Retribution & the Greater Good. Discipline and Deterrence are forward-looking. In the case of damned sinners, no future outside of hell is anticipated, so there is no need for Discipline. Also, they have been sufficiently shielded from the saved, so there will be no need to Deter their future actions. Neither Discipline nor Deterrence could justify eternal torment. We are left with Retribution & the Greater Good as the reasons for eternal torment. These could serve us well in the inner places of our heart as we search to justify our own actions. If you believe that God’s Retribution will one day call for eternal torment, then any other retribution will seem relatively insignificant. In some situations here on earth, it might just make sense that certain people need to get a foretaste of the ultimate Retribution that God will dole out. As his representatives on earth, we might sometimes be asked to act on his behalf. If true Justice can somehow justify infinite pain, certainly it can justify much lesser amounts. Doesn’t this seem reasonable to you? Doesn't it seem possible that a belief in eternal torment might make it easier for you to inflict retribution here on earth? I'm not suggesting that people explicitly refer to the torment of hell when justifying their own attempts to inflict pain. I know hell didn't cross my mind as I was deciding whether or not to empty the vacuum, but I do believe that my core understanding of the Gods' character has a great impact on those types of decisions. If the core essence of God includes the capacity to inflict infinite pain, then it will be that much easier for me to justify the minor pains that I might inflict upon my brothers here on earth. Have I convinced you yet - that our understanding of the character of God seriously impacts how we live and how we treat others? Let me make a couple more points. Psalms 50:16-20 But to the wicked God says, "What right have you to tell of My statutes And to take My covenant in your mouth? For you hate discipline, And you cast My words behind you. When you see a thief, you are pleased with him, And you associate with adulterers. You let your mouth loose in evil And your tongue frames deceit. You sit and speak against your brother; You slander your own mother's son." Psalms 50:21 "... You thought that I was just like you..."
So, this thought is not original with me. I am repeating what was said thousands of years ago - that one way we justify our own sins is to claim that we are acting within the character of God. If God is willing to send people to never-ending torment, what actions in our own lives might we also justify? The final reason we must grasp the true character of God is because it impacts the gospel message we preach to those outside the church. …while, yes, God is supposedly a "loving" god, he also sends you to hell if you don't buy into his schtick… Bottom line, God says, follow me or it's hell for you. In any other circumstance in life (say a president's rise to power), people would be fools to buy that line. Follow me or die! …And Christians like to parade it before the world as though it is a quality to be admired, but people aren't that stupid anymore. They see that is petty. That is weak. That is impotent. That is very very small. It is not a god worth following at all. This commentor is not alone. 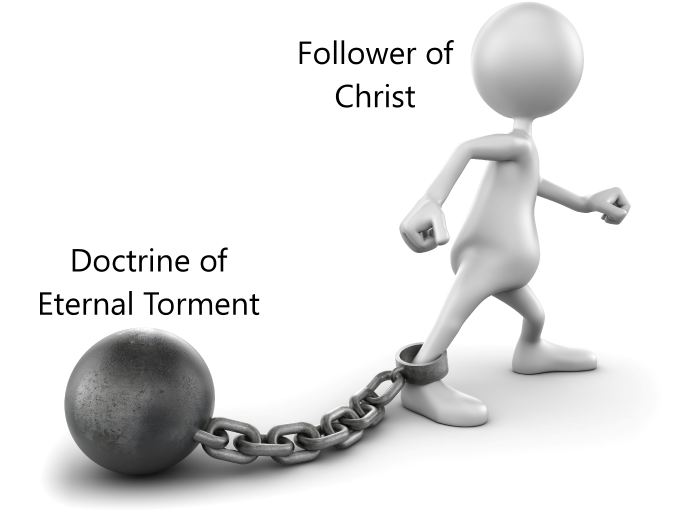 Many people reject the gospel of Christ primarily because of the doctrine of eternal torment. They might be attracted to the character of Christ presented in the gospels, but are repulsed by the thought of eternal torment. This Jesus, this Jesus, is the one who will condemn unbelievers to an eternity of torment. This Jesus will essentially look each unbeliever in the eye and say, “I now condemn you to an eternity of unbearable torment.” That is the gospel message we preach. I can understand why many reject it. If eternal torment is the truth, then we must preach it. But if it isn’t the truth, then untold damage is being done by clinging to this error.